Today I had the distinct pleasure of meeting artist Steve Rolston at a signing at Legends Comics in Victoria. Steve is probably best known for his work illustrating the first four issues of Greg Rucka’s Eisner Award winning series espionage series, Queen & Country. 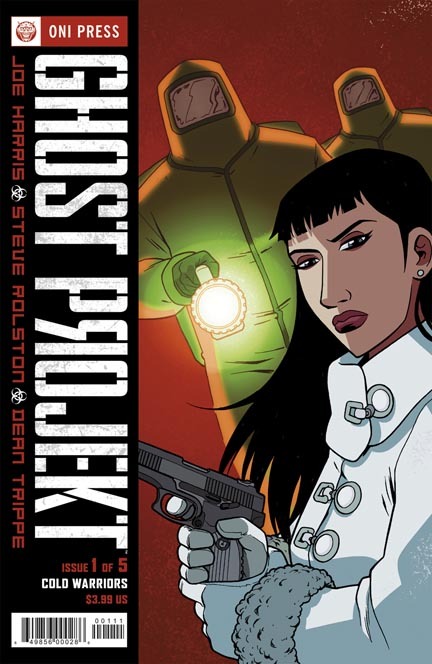 He has also worked on such varied titles as Emiko Superstar, Pounded, Mek, Teenage Mutant Ninja Turtles, The Escapists, Degrassi and the supernatural thriller Ghost Projekt, not to mention One Fine Day: a graphic novel which he wrote as well as illustrated. I thoroughly enjoyed chatting with the amiable Steve Rolston and he was kind enough to not only answer some questions that I had but also to sign copies of Mek and The Escapists for me. Steve will be staying in Victoria for another day to attend Sunday’s VIMACS II event at Pearkes Field House at Tillicum Mall, so if you missed him at Legends today then you’ll be able to meet him there tomorrow. I highly recommend that you do so as you’ll not only be supporting a great Canadian artist but a nice guy as well. It’d Be A Better Fundraiser Than A Bake Sale.